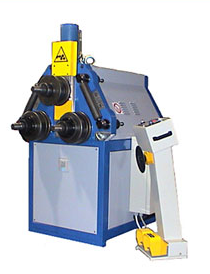 The Saf range of pyramid style ring rolling machines where all three shafts are gear driven and manufactured from hardened and grounded strength steel. These machines are very flexible and are suitable for bending a variety of sections including tube, angles, flats, I beams and special profiles. The HP version has an intelligent quote positioner that allows the setting of different positioning values and inserting directly the bending radius. 10 bending radii predetermination programs in single and multipass.